Relationship isn’t to make you happy, it’s to make you conscious. So don’t seek happiness in relationship but seek to be conscious. That’ll be your greatest gift not only to yourself and your relationship but the whole of mankind. So our first retreat was a total blast. It’s better than I expected though I had no expectation. 🙂 Everyone loved it and in fact the team is having a retreat fever right now. Then my accountant Leslie, out of the blue, suggested that we did another one in NYE, not April or May as originally planned. It was fun and relaxing but above all there were a lot of breakthroughs among the ladies as well! They came with a lot of confusions, doubts and unanswered questions and left with such a new aura. Their energies have shifted. And that’s the point. Oh what better way to spend NYE than having your mind blown away in a self-exploration endeavor that will crack you so open and a super intimate NYE party to welcome the new dawn, the new beginning? What better symbolism of a rebirth than that? This will hopefully be our annual tradition. The retreat will be different each time so you don’t want to just come one time but at least once or twice a year because this is the place for you to recharge in every sense of the word. And I have learned that 2 days isn’t enough because there is so much to cover and share so the next one there will be option of 2 or 3 days and even one day on the NYE if that’s the only time you can spare! And this time of year is when breakups usually happen so this retreat is a solace to those who need emotional support the most. Write me below if you want to talk to me direct via Skype for about 20 mins about how this retreat will help you a great deal in helping your stagnant relationship, depression and anxiety either caused by relationship or life issues, healing yourself and moving on with your life (or getting him back if that’s what you want as I have helped tons of women get their exes back). Now in the video above I talked about what being unconscious is all about. Follow me on FB to be in the loop of the upcoming live video classes. Being unconscious is being fast asleep, being in a dream and not knowing we’re dreaming. It’s being unaware. It’s being led and duped by your unguarded mind… and in the process it creates so much suffering for yourself and people around you. You ask, how can I be unconscious when I know I’m not asleep and I know I’m reading this and even I know I’m talking to you in my head? If you don’t understand what I say, that’s the first sign of being unconscious (and don’t worry, 95% of population or more are unconscious so it’s not something that is very commonplace). Conscious people recall the time when they were unconscious, when their lives were at the mercy of externalities and a lot of times they slid off into hot water of some sort, one after another. Suffering is the result of being unconscious. Conscious people don’t suffer anymore. They experience pain, yes, but they can’t suffer anymore because the nature of suffering -i.e. the grasping of the ego- has been seen so they can’t be duped anymore. Unconscious people buy everything their mind says wholesale and no surprise this absolute belief in the mind is why they get into one trouble after another. It’s like the blind being led by the blind. The mind is like a blind person. And following a blind person shows your blindness as well. So what is being conscious or aware actually like? Awareness is when there is a gap between thoughts. The more gaps you have, the more aware you are. And gaps are what slows down the mental processes, so the more gaps there are the slower your mental processes are which mean the less friction you feel. And in those gaps the Witness reside. The Witness ins’t entangled in one position or the other. It’s not for or against, condemning or defending. It remains neutral for the most part till it becomes obvious that it needs to take side because situations (“what is”) warrant it. And relationship can actually make you conscious so instead of seeking happiness in relationship -which is an impossibility- seek to be conscious. 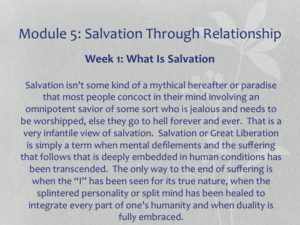 It is the background of my new program Module 5 Salvation Through Relationship (we have one class left if you want to attend live). It’s the sequel of Module 1 Journey Inward. 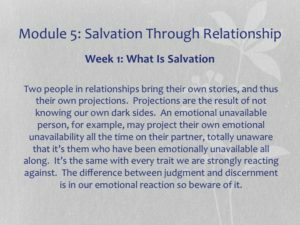 You will learn through various inner reactions you experience in response to the interactions you have with your partner the areas you need to work on. Typically those areas are the unconscious part of yourself and they became unconscious because they were repressed and denied thanks to your conditioning. And you will project the unconscious parts of yourself onto other people causing a lot of trouble in the world in the process. Your unconsciousness will sooner or later influence the world around you. A bunch of unconscious people are enough to create wars, discords and destructions to our Gaia. 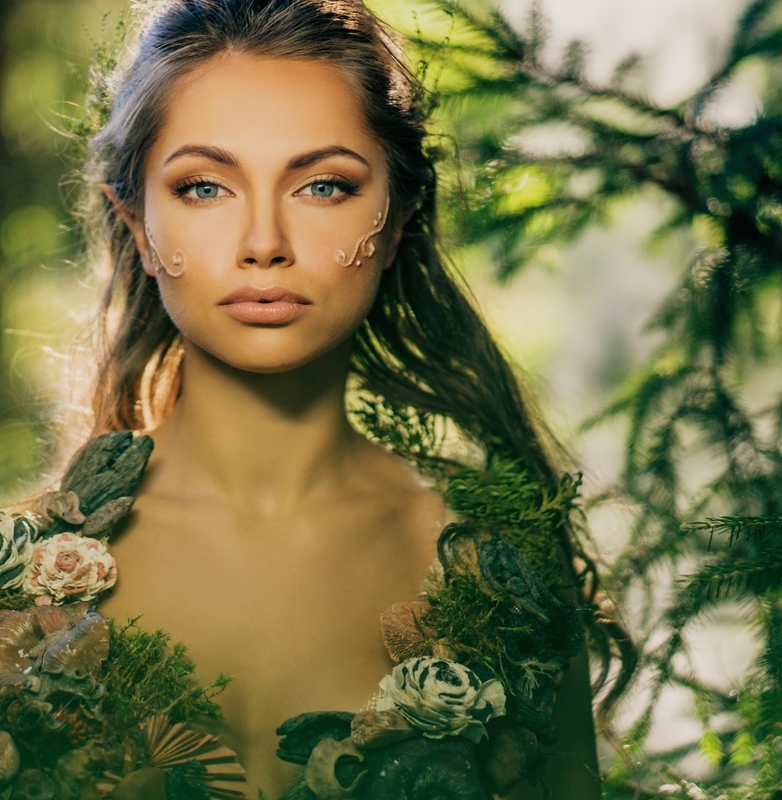 So our main job is a member of the human species is to take ownership of and hold ourselves accountable for our own change, transformation and evolution. And you can do it in the comfort (or discomfort) of your own relationship. Have you read my book yet? If not grab it here because you will learn so much about a lot of things that haven’t worked for you in your love life and how to fix them so you become a high-value woman. And I have just recently updated it with additional 20 new pages so there is more meat in it now. If you sign up to my newsletter, you will receive the first three chapters. This book is a primer on dating and gaining a man’s love and adoration for any woman. Thanks Katarina Phang, I am very happy to read your advice. “And relationship can actually make you conscious so instead of seeking happiness in relationship -which is an impossibility- seek to be conscious.” – Nice said. I’m loving reading Katarina’s advice! I am a bit bothered, however, that some of the passages I’m reading here I recognize word for word, yet they have not been attributed to their original source. I’ve heard Eckhart Tolle speak many of these sentences and passages in videos. I feel it would be appropriate to attribute quotes and passages to the people they were clearly taken from rather than being passed off as original. Which passage is that? I put Eckhart Tolle when it comes from him, I have no problem with that. In the article it’s all my own discovery/words. Might be similar with ET has said but no, it’s not his passage. You don’t believe we have discovered the same thing (because there is only one Truth)? Thank you and spot on! We will talk a lot of things the same way cause we have discovered the same liberation.